This past summer, I went on my first road trip with a few of my friends from Vancouver to Calgary, spending a few days in the Banff National Park. Instead of showing you just the sketches I made, I've recently begun making videos sharing the stories and adventures behind my sketches. I'm very new to video making and I'm working on getting better so please let me know how you think I could improve or techniques I should try out. Disregarding the forest fires my friend Tristan and I rented a car and left Vancouver on a Friday after work. It was our first time driving on a road trip and we're both very excited. 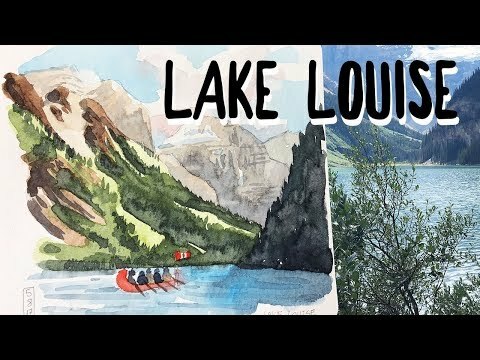 We stayed in a hostel in Kamloops and after a quick sketch of the city shrouded in smoke in the morning, we drove for another five hours to get to Lake Louise. 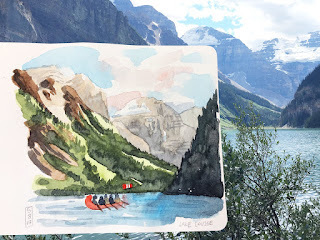 Once we got to Lake Louise, we met up with Felix, another friend of ours. Although it was crowded, the lake and the mountains hugging it was absolutely breathtaking. I've seen pictures of glacial lakes before but I never thought that it would actually be turquoise coloured. It was a challenging sketch for me since I usually draw buildings or more rigid subjects. After that, we went back into our cars and drove down to Calgary.